I hope, that if these images excite your imagination, you follow my journey into the realms of my next artistic adventure! In the past, the only place that you could purchase my works were in commercial galleries, in Sydney, Melbourne and Adelaide. Things have changed enormously in the last few years, with new technology making the entire planet available to everyone. 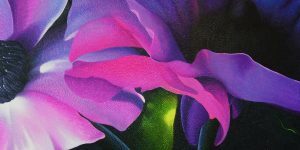 Over the last few years, whilst working on my painting subject matter, I began to develop some digital flower images that I felt were standouts, both in their striking play-of-colour and in their visual composition. I first penned that quote in an article I wrote for an art publication many years ago. It was at a time when I began to become dissatisfied with the restrictions of realism. Although realism was my stepping stone into the art scene and I fervently followed its conventions and restrictive practices within my wildlife and figure paintings, my very being was desperately seeking to escape to a more artistic freedom. In the following years, through rigorous experimentation, I slowly began to loosen the stranglehold of realism and began introducing elements of abstraction into my body of work and slowly but surely began seeing my work develop into a more loosely rendered entity. It was not until the end of the 1990’s that a major change took place. This was when I decided to use my sculptural ability to create new exciting three dimensional paintings, based on anthropology, geology and paleontology. These sciences have enthralled and inspired me since my childhood and I guess being able to express these subjects in a visual medium, was too hard to resist. Whilst creating these sculptured works, certain elements evolved within them and I began to see a new way to produce a new art form, one, which at a later stage, I would term ‘Contourism’. These Contourism works, evolved from another science I have been closely involved in for most of my life, Botany. 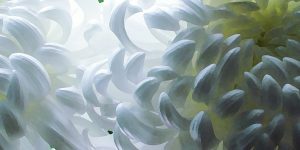 I decided to create a body of work focusing on close-up flower images, where raised contour lines defined the shapes and movements of petals, and every other nuance of some of our favourite flowers. Within this collection, I did stray and create some abstract works which work equally as well as the flowers in their three dimensionality, but the flower paintings have remained my favourites to this day. In this ‘WORKS’ area, you will find works dating back to around 1980 and are set out in date ranges as you hover over the ‘WORKS’ tab. I am sure that you will see a progression in style and subject matter as you work your way through the years. As I produce new works, I will be adding them to this site, all for your viewing pleasure and some available for sale in my stockroom. I endeavour you follow my journey and share the excitement of the experience, just as I have over all these years and more important, as I embark on new, varied and innovative artworks!